She started playing piano and violin at the age of 3 and currently study piano with Dr. Svetlana Arakelova and violin with Dr. Laura Tagawa. She has been invited to perform at various venues in Tucson and Japan including Tucson Annual Japanese Festival, Tucson Museum of Art GALA, churches, Tucson Folk Festivals and more. 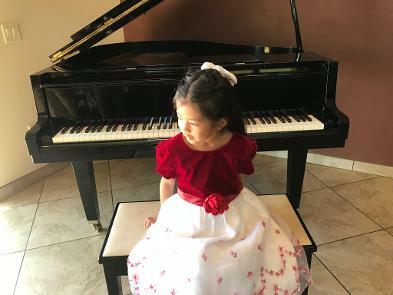 At the age of 5, she won 1st place at Merit Scholarship Competition and medals at Arizona State Competition and in 2017,she won 1st place at Young Artists Competition by Civic Orchestra of Tucson and Judge’s Honorable Commendation by Tucson Symphony Orchestra. She Performed Berkovich piano concerto with civic orchestra in 2018.